There’s a sense of ancient history in the south of France. Roman-era towns and crumbling ruins dot the countryside — even the modern highways follow the ancient “Via Agrippa” of the Romans. Winemaking here is just as old, and archeologists have found presses dating back to 400 BC. Winemaking in the town of Séguret, twenty minutes east of Chateauneuf-du-Pape, dates to the year 611. Nicolas Haeni’s Domaine Malmont dates only to 2013, but his wines show the experience of his decades of local winemaking, and the expression of centuries-old terroir. In his profile on Haeni from a few years ago, the Wine Spectator’s James Molesworth calls the Malmont wines “potentially outstanding” — we think he’s already there. 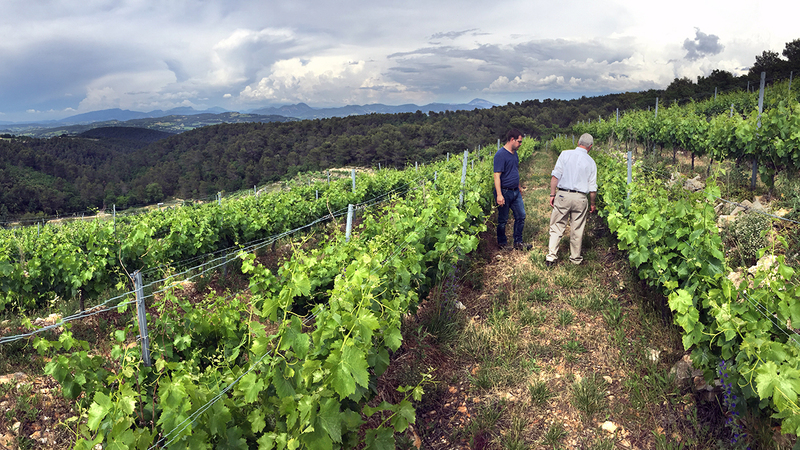 The Malmont vineyard is high in the hills above Séguret, where ripening is slower and balance is easier to achieve. With a steady breeze and abundant sunshine Haeni is able to farm entirely organically – wild herbs sprout between his rows, as bees and birds flutter between the vines. Malmont’s 2016 Séguret arrived a few months ago, and it’s exceptionally good. A 60/40 blend of Syrah and Grenache, it shows a density and depth that’s uncommon in such an energetic wine. Molesworth called it “fresh” and “pure,” finding “raspberry and blackberry” alongside “violets and minerals,” awarding it 90 points. To this we’d add notes of black pepper and earth. Think of this as a younger, fresher, juicier Châteauneuf-du-Pape. It ages beautifully (if you can keep your hands off it), but today offers a dark syrah-heavy core wrapped in a sleek, intense body full of intensity and life. Pair this with a stew and give it an hour in a carafe.